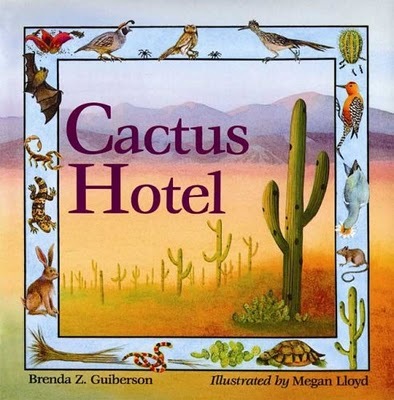 Cactus Hotel, by Brenda Z. Guiberson, is an awesome book that shows kids the life cycle of the saguaro cactus, as well as biodiversity that encompasses the desert ecosystem in the North American Sonoran desert. The book focuses on all the different species that live inside of the saguaro cactus (while it's living and after it dies). It's a fantastic piece of literature to integrate in a Life Science Unit. Recreate how a cactus absorbs water by using a sponge, toothpicks, a flashlight, and clay. Visit Ocean Oasis for the full experiment! Encyclopedia of Life - create a field guide to organize desert species! Kids can collaborate on their field guides for a project. Skype with kids in Arizona about the desert and the saguaro. Use Google Earth to check out the desert terrain! How do cacti survive in the desert? How do animals stay cool in the desert? Talk about animal adaptations. Biodiversity: Choose an animal from the desert for a report. Kids can use EOL's field guide for this assignment. How does their animal interact with different organisms in the desert ecosystem? Where does the animal make it's home (various animals live inside of the saguaro, hence the name "Cactus Hotel). Measure out pieces of string the "exact lengths of the saguaro cactus at various ages." - Hinkle. Then, compare the kids height to the saguaro. Afterwards, graph your results. What age of the cactus equaled the majority of the students' height?